+ Kick start your game development, and build ready-to-play 3D games with ease. + Understand key concepts in game design including scripting, physics, instantiation, particle effects, and more. + Test & optimize your game to perfection with essential tips-and-tricks. + Written in clear, plain English, this book takes you from a simple prototype through to a complete 3D game with concepts you'll reuse throughout your new career as a game developer. Game Engines such as Unity are the power-tools behind the games we know and love. Unity is one of the most widely-used and best loved packages for game development and is used by everyone, from hobbyists to large studios, to create games and interactive experiences for the web, desktop, mobile, and console. With Unity's intuitive, easy to learn toolset and this book - it's never been easier to become a game developer. Taking a practical approach, this book will introduce you to the concepts of developing 3D games, before getting to grips with development in Unity itself - prototyping a simple scenario, and then creating a larger game. From creating 3D worlds to scripting and creating game mechanics you will learn everything you'll need to get started with game development. This book is designed to cover a set of easy-to-follow examples, which culminate in the production of a First Person 3D game, complete with an interactive island environment. 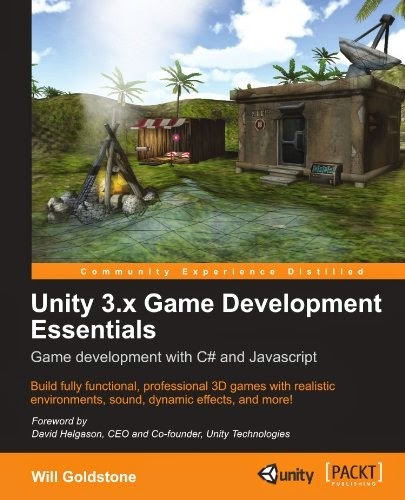 All of the concepts taught in this book are applicable to other types of game, however, by introducing common concepts of game and 3D production, you'll explore Unity to make a character interact with the game world, and build puzzles for the player to solve, in order to complete the game. At the end of the book, you will have a fully working 3D game and all the skills required to extend the game further, giving your end-user, the player, the best experience possible. Soon you will be creating your own 3D games with ease! +Deploy your game to the web and desktop and share it with the wider world for testing and feedback. If you're a designer or animator who wishes to take their first steps into game development or prototyping, or if you've simply spent many hours sitting in front of video games, with ideas bubbling away in the back of your mind, Unity and this book should be your starting point. No prior knowledge of game production is required, inviting you to simply bring with you a passion for making great games.